15268 Riding through the midnight hour upon her strapping unicorn, the Midnight Fairy softens the dark of night with her graceful beauty and delicate lantern. 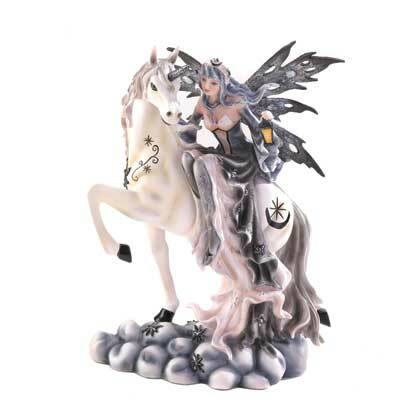 Detailed with starry flourishes and timeworn wings, this marvelous figurine will delight all who gaze upon herFelt lining on bottom. Item weight: 3.6 lbs. 8" x 4½" x 10" high. 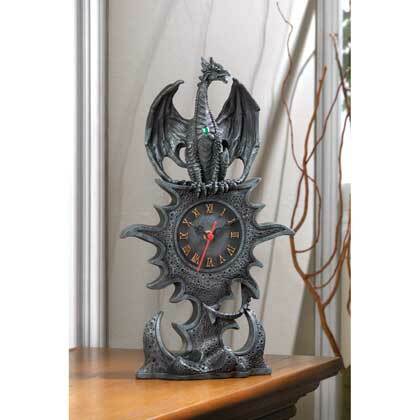 15257 This dramatic mantel clock features a mythical winged dragon guarding the eternal hands of time. Golden roman numerals on the face of the battery-powered clock are the perfect accent to the steel-gray color of the clock and base, and a bright green jewel adorns the chest of the perched dragon. 9 1/8" x 3 1/8" x 15¾" high. 15258Whatever you choose to keep in this finely detailed treasure box will be safeguarded by a scaly pink dragon in repose, whose vigilant watch never strays from his bejeweled surroundings. 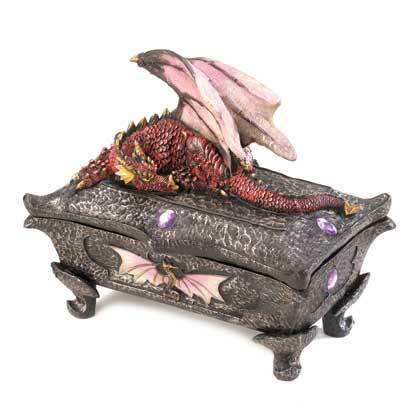 Purple faceted jewels and a relief of the dragon himself, with wings spread, highlight the base of the treasure box that rests on curved feet. Item weight: 1.8 lbs. 7½" x 4½" x 6¼" high. 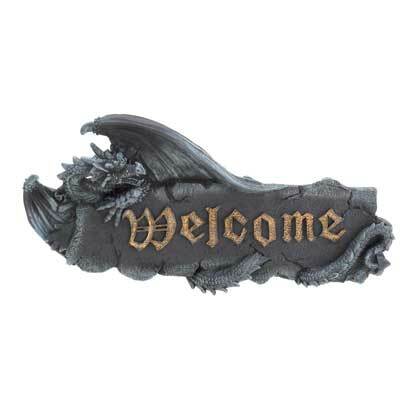 15263 Give your guests a legendary welcome they won’t soon forget with this medieval welcome plaque mounted near the entrance of your castle. The plaque is finished in black with “welcome” in antique golden medieval lettering. Item weight: 0.8 lb. 11½" x 1½" x 5¾" high.